This Bias Ruler is a 'must-have'! Bias binding used to be a hassle as often I would have to undo the stitches because the strips would not line up perfectly. No more! 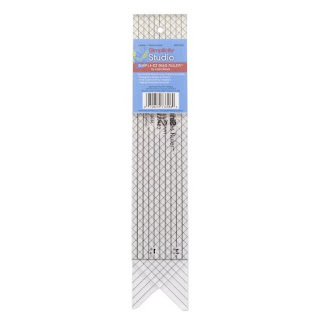 Cut the strips with the ruler, making sure you also cut on the two notches at both ends of the ruler. Then, align the strips perpendicular to one another, matching the notches. Voila! I have so many rulers, but this one will be used all the time... I got it a few weeks ago and used it for the first time this weekend. Have you worked with this ruler? If not, you make consider getting one - I am so glad I did! Do you have a ruler you can't work without? Woman, you need one of them!! !